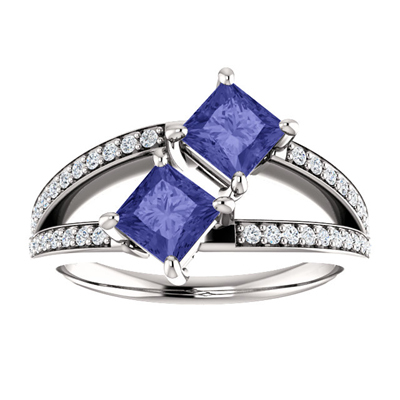 Tanzanite is anything but a plain blue-purple color. It is also a color symbolic of beauty and class. Our 4.5mm two stone tanzanite engagement ring is paired with 46 diamonds that are as intricately cut as these two tanzanite stones are. They all mix in well with the 14k white gold base that we have included. We guarantee our 4.5mm Princess Cut Tanzanite and Diamond "Only Us" Engagement Ring in 14K White Gold to be high quality, authentic jewelry, as described above.